What a great way to close out 2015 and welcome 2016 by announcing Paradigm® 15.5, our latest comprehensive solution suite. Paradigm 15.5 reinforces and extends the performance gains established in Paradigm 15, released earlier in the year, and enables you to focus attention on your most critical workflows. The new release provides more automation, tighter product integration, and expanded third-party connectivity, all aimed at improving productivity and return on your investment. The new and enhanced technologies in Paradigm 15.5 incorporate more data and automate the earth model updating process, giving you new insights into existing assets, even when available data is limited. This helps you increase efficiency and cut costs without compromising the safety and sustainability of your assets. Additional new features include the Paradigm QSI solution, which has been updated with a new Wedge Modeling application that analyzes the effect of bed thickness on seismic amplitudes and provides the option to easily test "what if" scenarios. New processing and imaging capabilities include 3D gather visualization, support for orthorhombic models, and Q-compensation. Paradigm 15.5 includes Geolog 7.4, which expands the reach of the industry’s leading formation solution into the engineering domain, and also offers a new geomechanics module that helps assess mechanical conditions around the wellbore, to provide a deeper understanding of the reservoir. This release expands connectivity between Paradigm and other G&G platforms, including Schlumberger’s Petrel seismic-to-simulation software. This enables you to access Paradigm’s advanced technologies while maintaining value from existing software investments. We invite you to take advantage of the technology updates in Paradigm 15.5 to help make 2016 a productive and prosperous New Year. 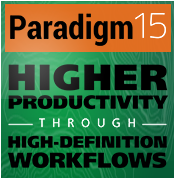 For all the details about Paradigm 15.5, click here.